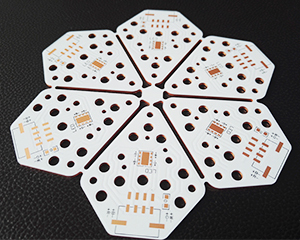 MCPCB, Metal Core PCB, thermal PCB, whichever name you prefer, they are all boards which use a base metal material as the heat spreader portion of the circuit board. The metal core of the thermal PCB can be aluminum (aluminum core PCB), copper (copper core PCB) or a mixture of special alloys. The most common is an aluminum core PCB.The thickness of metal cores in PCB base plates is typically 30 mil - 125 mil, but thicker and thinner plates are possible. MCPCB copper foil thickness can be 1 - 10 oz. Material including: Laird 1KA04、1KA06, Bergquist MP06503, HT04503, etc.